Explain the five principles of inclusive leadership. Put the principles of inclusive leadership into action. Inclusive leadership takes constant practice, bravery, respect, and reflection. It’s important to remember that we are all learning on our Equality journey. We have to make room for mistakes, create opportunities for education, and move forward with positive intention to reach Equality. Here are five ways you can do this in your own workplace to create an inclusive workplace for all. Integrate Equality into everything you do. Keep Equality top of mind in every business decision and relationship. When we lead by example and are visibly thoughtful in our actions, we have the power to influence the culture around us to do the same. Here are a few ways to lead with Equality in your business. Add Equality to Your Goals: As we know, prioritization steers our businesses. Prioritize Equality by formally adding it to your annual goals and vision statement for your team and company. We seek to hire the most qualified candidate for the job. We strive to have a candidate pool that reflects our communities. We ensure fair and equitable hiring processes. We map candidates to core competencies and our values, not culture fit. 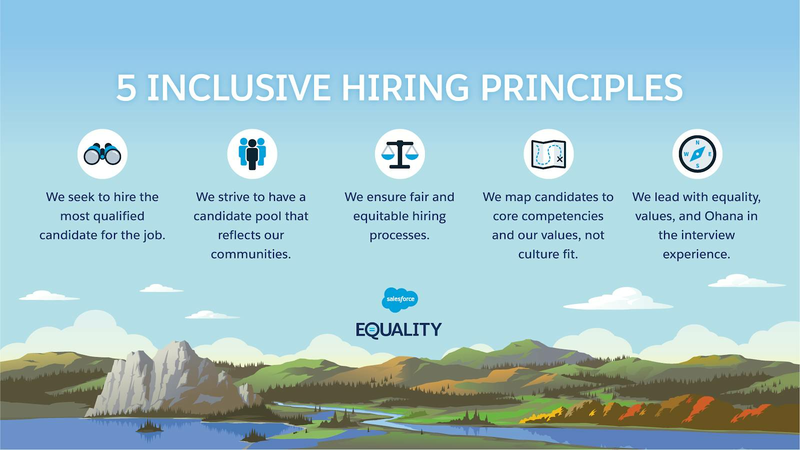 We lead with Equality, values, and Ohana in the interview experience. Be an Ally: When we talk about feeling included, we emphasize the ideas of feeling valued, heard, and empowered. Each of us can help elevate the voices and platforms of our employees by following four simple ally practices: Ask, Listen, Show Up, and Speak Up. Ask others about their experience and share yours. Listen with empathy and seek to understand different perspectives. Show Up by being present, engaged, and committed. Speak Up as an advocate and evangelize your allyship among others. As a leader, when you practice any of these steps, you are demonstrating to your greater team how they can be an ally in their own lives. 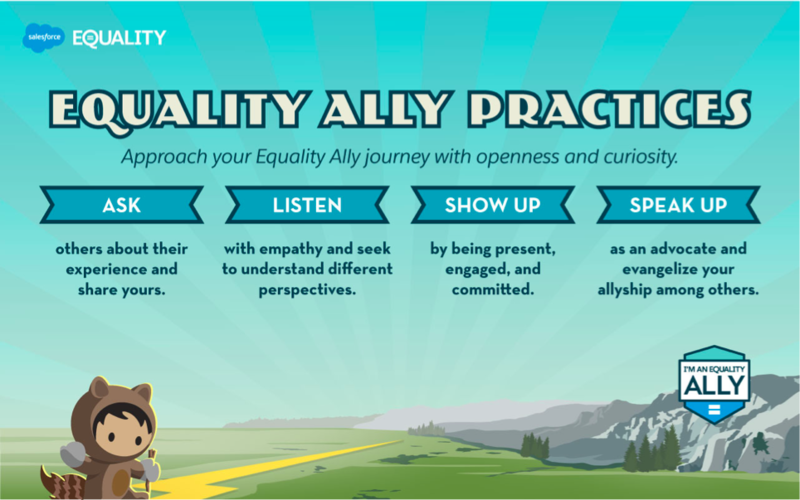 To learn more, take the Equality Ally Strategies module. Understand Your Team’s Unique Strengths: Every person brings a unique advantage to the table. Some people are better at public speaking, while others are more skilled writers, for example. Or some may be driven by the big ideas, while others may be task-oriented. Understanding these skill sets and preferences can help you determine how to make a more comfortable and supportive environment for all. Support Flexibility: Providing support for major life events, as well as varying family and home structures, enables everyone to have equal opportunities to succeed in the workplace. For example, primary caregivers may benefit from flexibility around pick-up and drop-off times for school. There are many mobile work tools available to us, such as video conferencing and collaboration apps like Quip. Use these technologies to allow for more flexibility in workplace arrangements and to support all families. Encourage Active Leadership and Growth: You may find that your employees have deep passions connected to driving Equality. Allowing time for employees to participate in volunteer activities or Employee Resource Group events can help them develop useful business skills, network outside of their team, align them to a deeper sense of purpose, and create positive social change in your workplace and community. You can visibly show your support for these activities through recognition and by simply showing up as an Ally at these events. 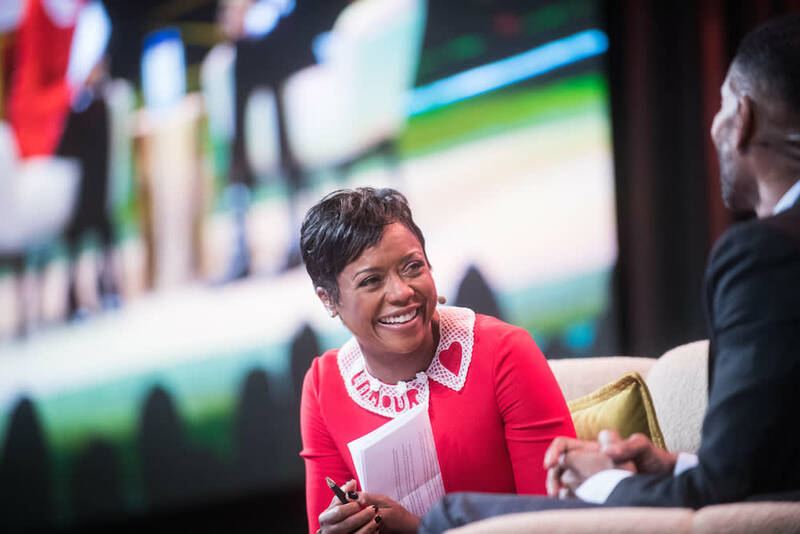 In an inspiring Ted Talk, Mellody Hobson, president, Ariel Investments, talked about the importance of having color-brave—not color-blind—conversations at work. She also spoke on the topic at Salesforce’s 2017 Dreamforce Equality Summit. Similarly, we can all lead with brave conversations across any Equality topics to reach a higher level of understanding and empathy through honest dialogue. However, it is important that as we enter these conversations, we do so with authenticity and respect. Here are a few tips for hosting brave and authentic conversations. Listen with Empathy: Listening is a key practice of allyship. Going a step further to listen with empathy is the difference between listening to respond and listening to understand. Empathy is the foundation of Equality. As a leader, if you take the time to listen with an open mind, it can dramatically shift the way you engage with employees as they become increasingly confident in using their voices and sharing their experiences. Tell Your Story: Personal storytelling is another area where it is critical to lead by example. To truly create a culture where employees feel empowered to share their journeys and bring their full selves to work, it is important to take the lead and share your own authentic Equality story. Create a Culture of Transparency: Create an environment where others feel empowered to speak up for one another and raise issues without fear. Establish platforms for employees to do so in a comfortable and safe way. Solicit regular feedback using anonymous survey tools such as Get Feedback and ensure that the process to report an issue is clear. Encourage Healthy Discourse: Be open to hearing differing views, and encourage others to express their opinions. Remember, discourse is healthy and helps drive innovation. According to a Kellogg study, Better Decisions Through Diversity (see the Resources section of this unit), diverse groups outperform more homogeneous groups because diversity triggers more careful information processing that is absent in homogeneous groups. Help drive innovation by ensuring that everybody is heard and all perspectives are valued. Emphasize Accountability and Forgiveness: As these difficult conversations rise to the surface, it is natural that people are going to make mistakes. As a leader, you can encourage your employees to take responsibility for their actions—understanding that though their intent may have been positive, it’s the impact that matters. At the same time, emphasizing forgiveness and establishing next steps to move forward from an uncomfortable situation is important. We all make mistakes and can approach our mistakes as opportunities to learn how we can all be better. Google conducted a study, What Google Learned From Its Quest to Build the Perfect Team (see the Resources section of this unit), that identified two behaviors that all good teams generally shared. The behaviors were 1) Equality in distribution of conversational turn-taking, and 2) high average social sensitivity. In other words, when everybody in a meeting speaks at least once and the team exhibits high levels of empathy, they perform better. Meetings are a staple of the modern workplace. Often, when we talk about issues of inclusion, we hear that women and minorities share the difficulties of being in meetings and not feeling heard or recognized. Leaders should practice these steps to make meetings a more inclusive experience for all. Invite People to Have a Seat at the Table: Are you meeting with the same subgroup every time? Bring in new voices from other groups to ensure diverse perspectives and ideas are being shared. Be Mindful of Remote Employees: In the world of modern technology, we often find ourselves in a meeting with people video conferencing from home or across the globe. It’s easy to forget or leave out those who are not physically in the room. Make it a point to address those who are on the video conference and make sure their opinion is heard. Give Credit and Recognition: It can be frustrating when someone proposes a great idea only to have someone else state the same idea and receive credit for it. Similarly, it’s disheartening to work hard on a project only for the credit to be given to someone else. As a leader, you can remedy this simply by visibly acknowledging the person who came up with the original idea or worked on the project and reinforcing their contribution. Rotate Note-taking: This can seem small, but a common microaggression (an action regarded as an instance of indirect, subtle, or unintentional discrimination against members of a marginalized group) reported in the workplace is that women often end up taking notes for the meeting, and as a result, are not seen as leaders or vocal in that setting. To avoid this, rotate who takes notes to ensure it isn’t the same person every time. Spread High-Visibility Projects: Ask yourself, “Are the same people on my team getting high-visibility projects over and over?” Give all members on your team the opportunity to step up. Consider Your Promotions: Did everyone have an equal opportunity? Were all candidates evaluated fairly? Share the Promotion Process: Is your promotion process transparent? Do people know what it takes to get promoted? Are professional development conversations taking place all year ’round? Fair and equitable promotions drive Equality in the workplace and impact the bottom line. McKinsey found that companies in the top quartile for gender diversity on their executive teams are now 21% more likely to experience above-average profitability, and those in the top quartile for ethnic diversity were 33% more likely. Diversity at all levels isn’t just the right thing to do, it’s also the smart thing. Celebration and team bonding activities are important parts of our culture and life at work. They bring us closer to our colleagues in a relaxing and fun setting. As a leader, be mindful of the way your team celebrates and bonds. Often, without realizing it, we leave people out because of the nature or time of the social activity. For example, it can be harder for caregivers to attend a happy hour versus a lunch event because they have childcare obligations. Similarly, if the activity consistently involves playing a sport, such as soccer or softball, this can be isolating to those with physical disabilities. When planning a team activity, consider the time (for example, happy hour vs. lunch), the location and nature of the activity (for example, sports bar vs. team VTO event), and whether everybody is able to participate in and share their authentic selves during the chosen activity. We can all do our part to drive Equality in our businesses and create inclusive workplaces. When we lead by example to cultivate an environment where everyone feels valued, heard, and has a sense of belonging, we create lasting positive change for our teams, our companies, and the world around us. Mellody Hobson TED Talk - Color blind or color brave?